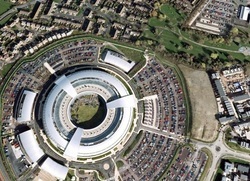 This building is GCHQ and is located near Cheltenham in England. GCHQ stands for Government Communications Headquarters and what goes on inside its walls represents some of the greatest secrets in the Western World. In this building many thousands of communications from across the world are monitored and interpreted. GCHQ co-operates heavily with its United States counterpart, The National Security Agency (NSA), which is based not far from Washington DC in Maryland, and also with the Pentagon in Washington DC. 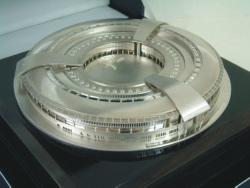 This is a copy of GCHQ made in silver. I think you will agree that almost anyone would consider that the building looks extraordinarily like most people's idea of a UFO. The building was opened in 2005 and literally thousands of people work there, constantly monitoring communications via radio, telephones, cell phones and of course across the World Wide Web. 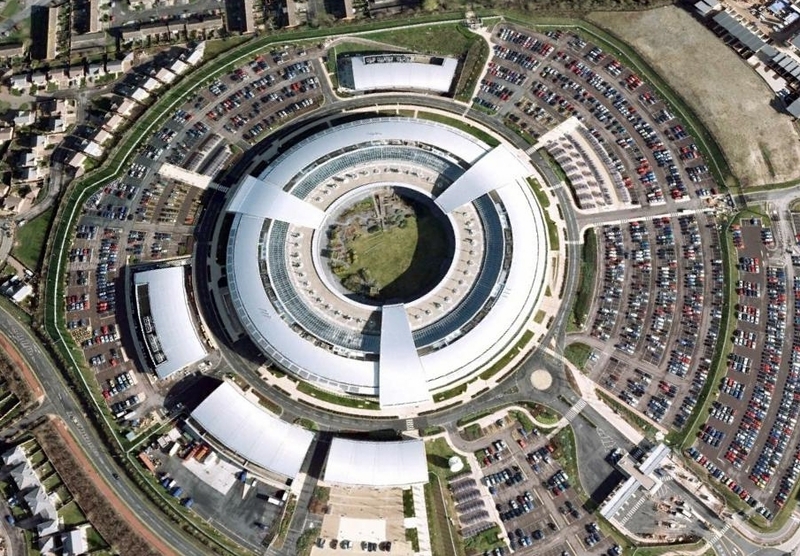 GCHQ is essential when it comes to keeping the West safe from terrorism and other threats but why did those planning this most secret of buildings choose to make it so obvious and so unusual? Doesn't this seem strange when a slab sided office block would have attracted far less attention? It is not my intention to go into what takes place within the walls of GCHQ, though of course we are all bound to wonder. Rather my interest in GCHQ stems from the fact that the building itself is one of the most remarkable structures on our planet. It isn't simply that it looks so distinctive but rather its shape and its dimensions. This is because GCHQ has a great deal in common with structures that have stood on the British landscape for almost 6,000 years. Its legacy has more in common with places such as Stonehenge (left) than it does with almost anything else created in Britain during the last three centuries at least. In fact the only other fairly modern structure created in Britain that has anything in common with GCHQ is a circle of houses in the city of Bath, which is mentioned elsewhere on this website and which is called King's Circus. The picture on the right is a view from the air of one of three associated giant henges, which are not far from my home in North Yorkshire, England. A henge is a circular ditch and bank with one or more entrances and there are literally hundreds of henges spread across the British Isles. The examples at Thornborough date back to around 3,500 BC and are amongst the most ancient structures to be found anywhere in these islands. They are also extremely large. What sets these henges apart is that they were built using the Megalithic measuring system, which is mentioned a great deal in this and my other websites. Many and in fact most of the truly ancient structures and monuments in Britain and France that date back to the Bronze Age and beyond were built using a linear measurement called the Megalithic Yard. 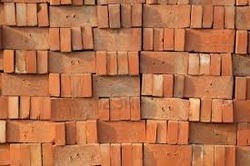 This is 2.722 ft in length or 82.966 cm. The Megalithic Yard was part of an integrated measuring system based on the size of the Earth. 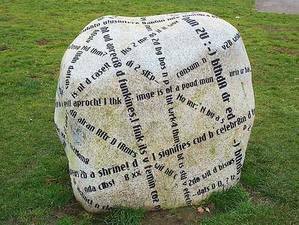 In many cases, both with regard to ancient structures, and also in the case of more modern ones, especially in Washington DC, the Megalithic Yard is found in units of 366 Megalithic Yards. 366 Megalithic Yards represents 1 second of arc of the Earth's polar circumference. This unit of 366 Megalithic yards was used in the Thornborough Henges, each of which has a circumference of 2 X 366 Megalithic Yards (732 Megalithic Yards.) I have superimposed a phograph of GCHQ onto the central henge at Thornborough, in order to demonstrate that it is 'exactly' the same size as the Thornborough henges. 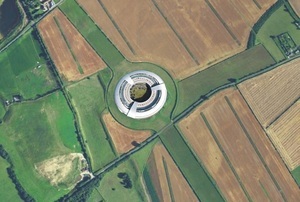 GCHQ sits neatly onto the bank tops of the 4,500 year old henge. Since the Megalithic Yard is not part of any modern measuring system and disappeared around 1700 BC, its use in this case is as odd as its constant use in Washington DC. Any reasonable person might suggest that the Megalithic dimensions of GCHQ are nothing more than a strange coincidence. However, there is one piece of information that makes this so unlikely that the notion is laughable. Look at the picture on the left. The red line extends from the very centre of the GCHQ building to the very centre of a small standing stone circle not far from GCHQ. This stone circle was only built in 2005! It is supposed to represent a piece of art and is located in a public park. The most curious fact regarding this very modern standing stone circle (most are in excess of four thousand years old) is that the distance between its centre and the centre of GCHQ is exactly 366 Megalithic Yards. This most certainly did not come about by chance. It was carefully planned. 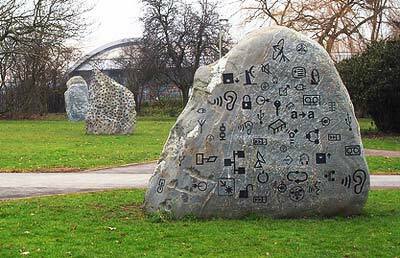 The stone circle, made of granite from Scotland, was planned and paid for by the company responsible for building GCHQ. Its position relative to the centre of GCHQ proves conclusively that the Megalithic Yard and Megalithic Earth geometry were perfectly well understood by someone as recently as six years ago. 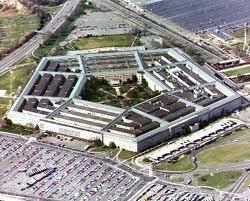 This is the Pentagon in Washington DC. It is the largest building in the world today to have Megalithic dimensions. It is exactly 2.5 times larger that GCHQ in Britain. A circle drawn around its exterior has a circumference of 5 X 366 Megalithic Yards. Is it a coincidence that the two biggest and most recent Megalithic buildings in the world are both committed absolutely to secrecy and that they also both deal heavily in communication gathering? In all probability there is no coincidence at all and it is virtually certain that these two buildings were given the dimensions they have for a very particular reason. This is Dr Robert Lomas. He lectures at Bradford University in England and is an expert in solid state electronics. His commercial background lies in rocket guidance systems but he has also researched and written extensively on some of the mysteries of our remote past. Robert has looked very closely at a range of Megalithic structures and I was lucky enough to do some important field experiments with him. 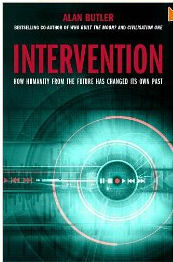 Robert considers it more than possible that many Megalithic structures, in particular chambered tombs and stone circles, were used for communicating across significant distances, using artificially enhanced telepathy and what we would today call remote viewing. Robert brought his expertise to bear on such a possibility and was aided by his background in physics and his long work with and understanding of electromagnetic radiation. Field experimentation in this subject is made difficult by the fact that many of the original Megalithic sites (hubs) are now damaged or missing but we did more than enough outline work to convince me that there was nothing fanciful about his outline conclusions. These are two of the stones that form part of what has come to be called Cheltenham's Stonehenge - in other words the small, modern stone circle that stands adjacent to GCHQ. All the stones used in this structure carry symbols of one sort of another. Some of the symbols area computer-related, others have to do with language and there are even quotes from the Bible. Fair enough, one might think because, after all the stone circle was financed by the builders of GCHQ, which is a place dedicated to dealing with communication. However, what this does not explain is why the form of a Megalithic stone circle was used for the installation, particularly bearing in mind that it stands adjacent to and in fact 366 Megalithic Yards from one of the largest and the most recent structure with Megalithic dimensions on the planet! The structure shown above and on the left is called King's Circus and is in the English city of Bath. It was built in the 18th century and is a circle of stylish Georgian houses. It is the first building I know of built in relatively modern times that has Megalithic dimensions. 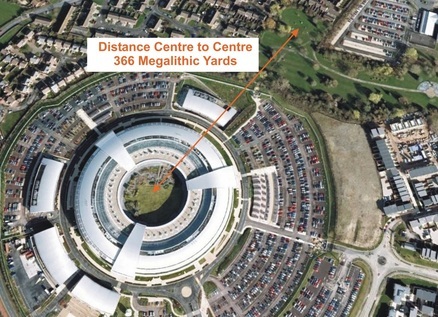 It is exactly half the size of GCHQ and has a circumference of 366 Megalithic Yards. It was planned and built by an architect named John Wood, a man steeped in knowledge of the ancient past and a contemporary of the men who planned and eventually built Washington DC. Before John Wood built King's Circus to my knowledge Megalithic measurements had not been used for almost 4,000 years and supposedly remained unknown until they were rediscovered in the 1960's by Professor Alexander Thom of Oxford University. The structure on the right is, of course, GCHQ at Cheltenham. It is exactly twice the size of King's Circus but despite the differences there is a continuity of thought in their style - the three roads in and out of King's Circus being replaced on GCHQ by three very grandiose entrances. I fail to believe that there is not some connection between these two sites. Remember that the first site, in Bath, is called King's Circus, and then look below at the logo for GCHQ Cheltenham. This incorporates both a crown and a circle. Many of the most important structures in Washington DC are connected by units of 366 Megalithic Yards, which is the same as 1 second of arc of the polar circumference of the Earth. These structures include the Ellipse, the Capitol, the Pentagon and just about every major intersection from the original city plan. It turns out that the same is true between GCHQ and King's Circus in Britain. 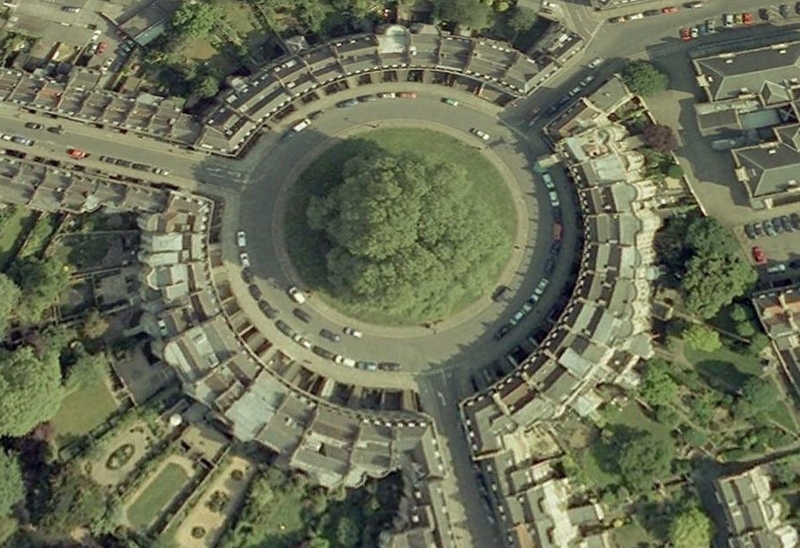 The distance between the centre of GCHQ and the centre of King's Circus is an exact 196 X 366 Megalithic Yards. Nor is this the only situation of note. 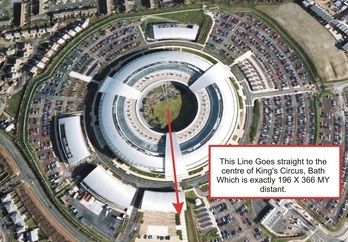 As can be seen from this photograph, GCHQ is also orientated so that a line drawn from its centre to its southern entrance would go straight to the centre of King's Circus. Bearing everything else in mind this simply cannot be a random chance event. It was clearly planned to be that way. The building shown in the middle picture is called Bletchley Park. It served the same function during the Second World War as does GCHQ now. Within this country estate in Southern England all manner of enemy codes were broken and it is said the Winston Churchill (right) believed that its existence shortened the war by maybe two years. Bletchley Park was also of great interest to President F D Roosevelt (left) who was President of the United States during WWII. 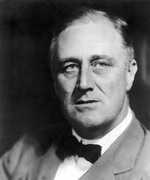 President Roosevelt was also responsible for building the Pentagon in Washington DC. Churchill and Roosevelt were close friends and were both Freemasons. 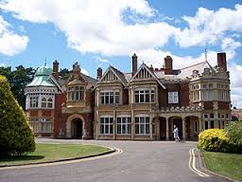 During the War American operatives were also stationed at Bletchley Park, which was in constant contact with the Pentagon regarding strategy and intercepted enemy codes. It was at Bletchley Park that the first mainframe computers were built in 1944. Ultimately these used both British and US technology and were called 'Colossus'. On Winston Churchill's orders, all but two of the ten Colossus computers were destroyed after WWII. The remaining Colossus computers were moved to Cheltenham and continued to be used for cracking codes until the 1960's. Much of what went on behind the doors of Bletchley Park remains a secret to this day. I suspect that communication was part of the function of the ancient Megalithic monuments. Some of the most important of the modern Megalithic structures exist for the same purpose, in particular the Pentagon in the US and GCHQ in Britain. 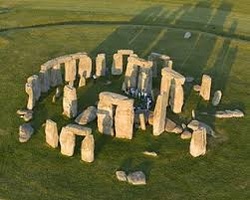 Whoever planned GCHQ clearly knew that it was Megalithic because they copied it from King's Circus. GCHQ is the same size as the three biggest henges ever created. It has a direct and enduring connection with the Pentagon, which is the biggest Megalithic structure on the planet. No effort has been made to hide these facts and indeed it appears that in its similarity to King's Circus and being possessed of its own, modern stone circle, GCHQ positively shouts its pedigree. Like so much else in the study of the surviving Megalithic legacy, it appears that these are simply truths hidden in plain sight. Peculiarities such as this have been my chief interest for quite a few years now and led to the research and writing of several books, some with Christopher Knight and others, such as the Washington DC - City of the Goddess, on my own. I placed this information on the Washington DC website because in many ways that's where it appeared to fit but it is inevitable that evidence 'leaks across' between one topic and another.